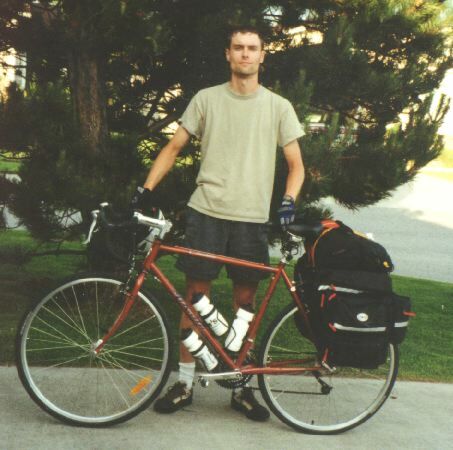 I have completed my bicycling trip from Vancouver to Waterloo in July 2001. It was 4900 km over 35 days. Traveling through 5 provinces and 3 states. It was quite a life experience. Seeing the rockies and the windy prairies. You meet a lot of interesting people, of whom many are doing a similar trip as you or even more. But there are miserable days too where you wonder why in the world you are doing such a trip. I've seen bears, elk, foxes, deer, beavers, coyotes, beefalo, eagles, falcons... but I've also had run ins with horseflies, mosquitoes, sandflies, earwigs, bees... I had some beautiful cool summer days and I've had cold raining/hail with winds blowing me so strongly that I was crawling along. This site has all the information of interest I can think of. Including my rants from my log. Care to comment on Yiminee?